Pay to win is not what The Mighty Quest For Epic Loot should be about. The Mighty Quest For Epic Loot, Ubisoft's cheerful free to play castle raiding game, went a little too far in its quest for Blings, its developer admits. 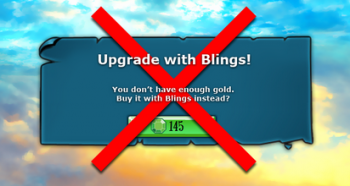 Blings, the game's premium currency, were becoming a pay-to-win mechanic, causing testers - the game's still in closed testing - much concern. Fear not, says Ubisoft, as it rolls back the monetization changes; pay to win is not what Mighty Quest should be about. "We realize that letting players purchase machinery upgrades went too far in what we think feels fair to monetize," says Ubisoft, in its rollback announcement. This change was met with unqualified support from Mighty Quest's tester community. "The worst thing that could have happened to this awesome looking game is making it a pay to win," says Seruvius, "making it nothing more than a glorified Facebook game." Perks, like new skins, are easily monetized, but making it so one player can constantly beat another through repeated use of his mighty Vorpal credit card is a bad idea, all the testers agree. This one's still very much in development, with no release date as yet.